Disclosure- The ChapStick® product, information and gift have been provided by Pfizer Consumer Healthcare. Now that summer’s coming to an end, the smell of sunblock will be replaced with the smell of freshly sharpened pencils. As you swap the beach bag for backpacks, and stock up for back-to-school season, don’t forget essentials like ChapStick®, America’s favorite lip balm. ChapStick® is a skincare staple that helps keep lips smooth and silky for the school year. Perfect for students, teachers and parents alike, ChapStick® is the backpack must-have. No matter the weather, you will want to keep your lips protected. No one likes the feeling of having chapped lips. We go through quite a lot of lip balm over here, and I’m sure you do as well. Make sure you have enough to get you and your family through the upcoming weather changes- this fun kit will help, yes? And the lunchbox-like tin is pretty cute as well. 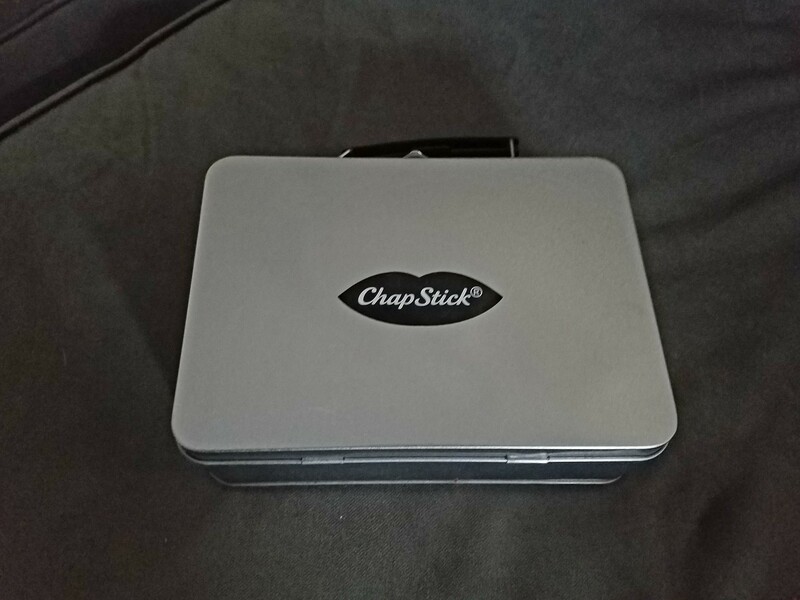 You will always know where your ChapStick is (unless the kids steal the tin, anyway.) Make sure you start off the new school year the right way with ChapStick®. Make sure you enter to win- feel free to use the RC form below to enter. Ends Oct 3, 2016. Good luck! I would keep this to use for my family. My 18 year old son will get this. I would share it with my husband and kids. I would share this with my family. We can all use it when the cooler temperatures set in! i would keep this for myself. i love chapstick. I would share it with my best friend. We go through a lot of chap stick. 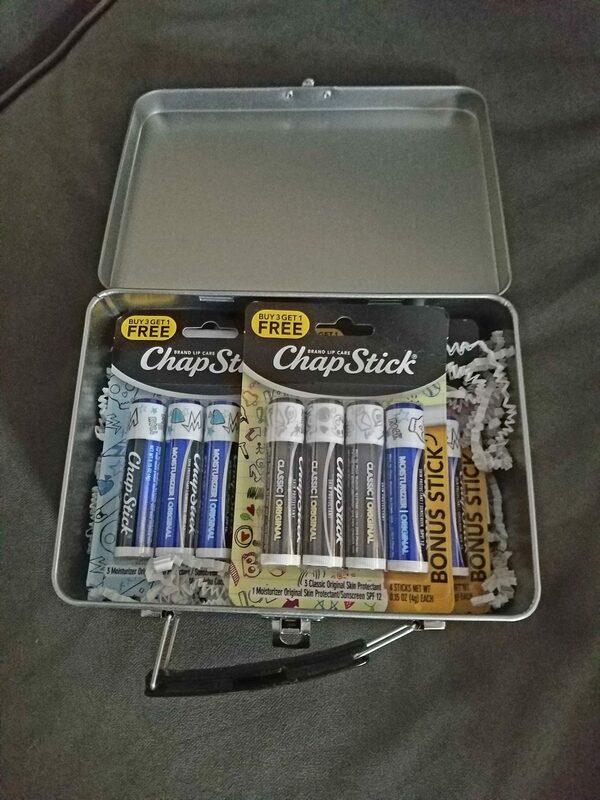 I’d give it to my friend, she uses a lot of Chapstick. I would share it with my family. My husband and 2 sons could definitely use some ChapStick! I’d share with my family. We have badly chapped lips this time of year. I would share with my sons and husband. I would share with my nieces. I would divide them between my family. I would share this with my family they need it! I will keep it for myself..I love chapstick. It would be for me and my one grandson who loves putting chapstick on. I use it all year around. I love the way it keeps my lips soft. I would share it with my coworkers if any of them needed it. I’d give it to my nephew who works outside and is always trying to prevent chapped lips. I will share this with my son. He was just complaining that his lips get really dry from his mouth guard for football. I would share with my mom and grandma. I’d give it to my husband who works out in the cold in the winter. I would keep it for myself, in the Winter my lips are always dry. I will be sharing this with my daughters, we are all lip balm fanatics! I believe I will give this to my granddaughter. I would keep this for myself, but share it with the family. I’d use the gift card for Christmas gifts and probably give some of the Chapstick to my daughter and use the rest myself. I’d share with my daughters! i have 2 daughters so we will share it! 🙂 we are all lip balm addicts! I would give it to my brother, strangely enough he is a chapstick addict. I’d keep the gift card! I would share this with my family. Everybody always needs chapstick in the winter! I would share it with my husband, I always seem to have chap lips. I will give this to various members of my family. I would share with friends and family. I would share with everyone in my family. We all use Chapstick. I would keep this and share it with my family! We love chapstick! I would give this to my oldest daughter. She is constantly using chapstick. Thank you! I would give this to my best friend, Jo and hope that she gave me one. I will share these with my coworkers. My son always has dried chapped lips. This would definitely be for him to use. I would share this with my family if I win! I will share with various members of my family. I would share this with my Mom. I would keep them for myself and share with my family. I will share them with my sister. I would share this prize pack with my sis. I would share it with my mother. I would split this up with my family. I would keep it for my family and myself. Thanks so much. I would keep one for myself and share the rest with my family. I would keep it, but I would be generous and keep extras on me to give away when someone could use one. I walk most places, and in the winter you really need this! !